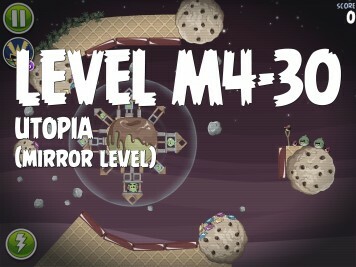 Here is our strategy for Angry Birds Space Utopia Mirror Level M4-30. This level is unlocked by obtaining 3 stars on Utopia Level 4-30. The strategy shown yields a score of 95,390. 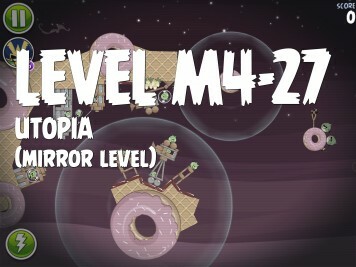 Here is our strategy for Angry Birds Space Utopia Mirror Level M4-29. This level is unlocked by obtaining 3 stars on Utopia Level 4-29. The strategy shown yields a score of 134,550. 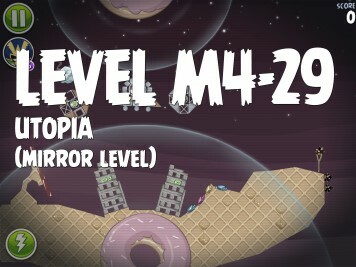 Here is our strategy for Angry Birds Space Utopia Mirror Level M4-28. This level is unlocked by obtaining 3 stars on Utopia Level 4-28. The strategy shown yields a score of 143,920. 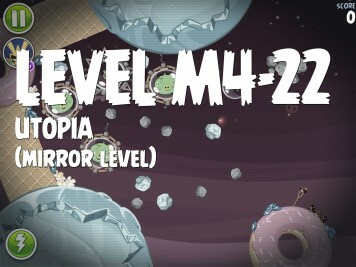 Here is our strategy for Angry Birds Space Utopia Mirror Level M4-27. This level is unlocked by obtaining 3 stars on Utopia Level 4-27. The strategy shown yields a score of 177,030. 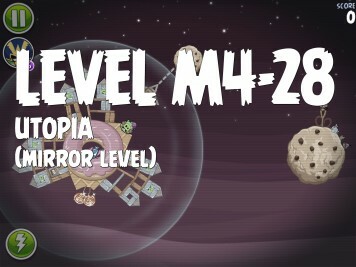 Here is our strategy for Angry Birds Space Utopia Mirror Level M4-26. This level is unlocked by obtaining 3 stars on Utopia Level 4-26. The strategy shown yields a score of 109,960. 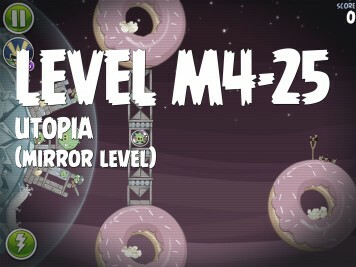 Here is our strategy for Angry Birds Space Utopia Mirror Level M4-25. This level is unlocked by obtaining 3 stars on Utopia Level 4-25. The strategy shown yields a score of 131,870. 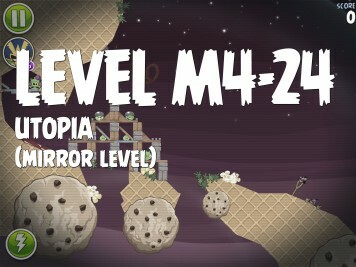 Here is our strategy for Angry Birds Space Utopia Mirror Level M4-24. 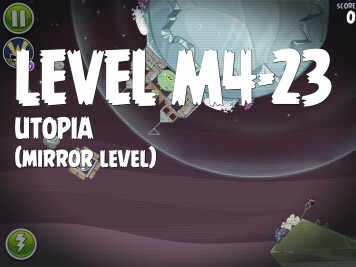 This level is unlocked by obtaining 3 stars on Utopia Level 4-24. The strategy shown yields a score of 134,230. Here is our strategy for Angry Birds Space Utopia Mirror Level M4-23. This level is unlocked by obtaining 3 stars on Utopia Level 4-23. The strategy shown yields a score of 113,120. Here is our strategy for Angry Birds Space Utopia Mirror Level M4-22. This level is unlocked by obtaining 3 stars on Utopia Level 4-22. The strategy shown yields a score of 134,880. 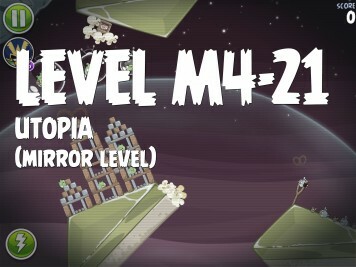 Here is our strategy for Angry Birds Space Utopia Mirror Level M4-21. This level is unlocked by obtaining 3 stars on Utopia Level 4-21. The strategy shown yields a score of 127,240. 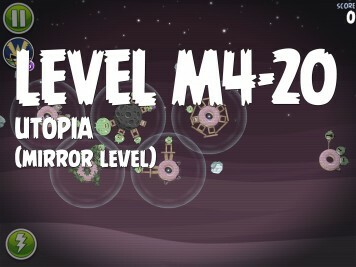 Here is our strategy for Angry Birds Space Utopia Mirror Level M4-20. 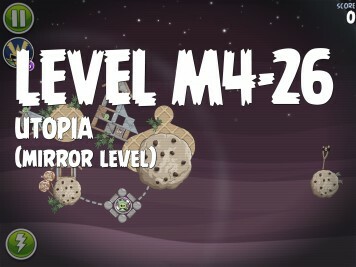 This level is unlocked by obtaining 3 stars on Utopia Level 4-20. The strategy shown yields a score of 118,780. 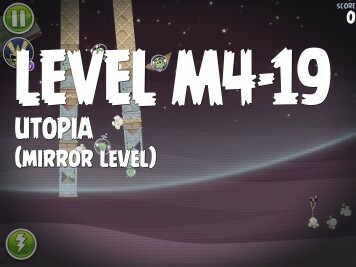 Here is our strategy for Angry Birds Space Utopia Mirror Level M4-19. This level is unlocked by obtaining 3 stars on Utopia Level 4-19. The strategy shown yields a score of 128,740. 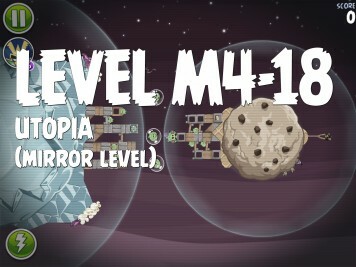 Here is our strategy for Angry Birds Space Utopia Mirror Level M4-18. This level is unlocked by obtaining 3 stars on Utopia Level 4-18. The strategy shown yields a score of 151,170.